The EU’s external borders are rapidly becoming untenable. Rather than resist, Europe should embrace its future as a continent of great diversity. The “refugee crisis” of recent months has split Europe in two. But unlike the liberal press would have us believe, the main dividing line runs not between those states (like Germany) that have taken a more humane approach to the crisis by accepting more refugees, and those (like Hungary) that have shut their borders and cracked down violently on anyone attempting to cross them. Rather, the real schism is the one between states and institutions that jealously guard their borders, clinging on to an exclusionary territorial logic that is rapidly becoming untenable, and the ordinary people on the ground – refugees, activists and locals alike – who are self-organizing solidarity beyond borders and creating a radically different kind of Europe from below. The former play on the fears of the continent’s increasingly precarious middle classes to exploit short-term electoral opportunities and to transform the world’s largest migration flows since World War II into a “crisis of border control,” rather than the humanitarian crisis it really is. While some EU leaders – most notably Angela Merkel – have inclined towards a more lenient approach, their superficial compassion nevertheless betrays the same logic of control. The latter, by contrast, are the true face of a changing Europe. From the beaches of Lesbos and Kos to the border crossings in the Balkans, from the fences at the Serbo-Hungarian border to the train stations of Munich and Vienna, and from detention centers across the continent to self-organized spaces like the refugee camp in Calais, the hundreds of thousands of refugees and migrants who have made their way to Europe in recent months are injecting a healthy infusion of bottom-up social change into the lifeblood of a moribund European community. In the process, they have inspired the birth of a transnational movement that is uniting Europeans across borders in solidarity with the newly arrived. 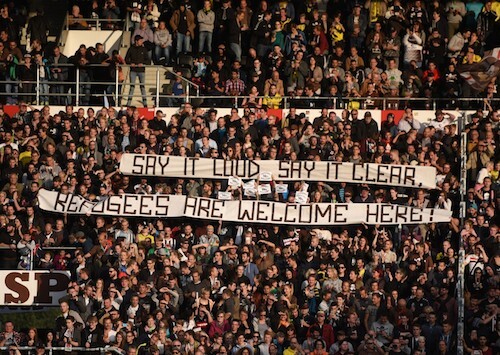 Coming on the heels of the continent-wide solidarity movement with Greece around the July referendum, the “refugees welcome” mobilizations are already changing the face of European politics by decisively shifting discursive momentum away from the nationalists and xenophobes. The nature and extent of the changes produced by these two simultaneous and interconnected processes can only be properly assessed in hindsight several years from now, but the long-term impact on European society is likely to be tremendous and irreversible. For one, refugees are breaking down borders in the very act of crossing them. The large movements of human beings over the past months have revealed just how weak and unprepared Europe’s ailing nation states really are, and how ineffective the EU’s external border regime remains. Fortress Europe, for all its evils and atrocities, is far more porous than its defenders like to think (or want us to believe). In truth, its walls are being breached daily by the thousands. As the influx of people intensifies, Europe is certain to throw up more fences and step up its external border patrols. But wherever there is a will, there is a way – and since the will for life will always be stronger than the capacity to withstand endless poverty, war and oppression, people will keep coming to Europe in search of a better future. And rightfully so. To be sure, there will be immense individual suffering in the process – from the tragedies of sunken boats to the brutalities of forced deportation. At a more systemic level, however, the hundreds of thousands of people who are currently making their way into Europe illuminate an incontrovertible fact at the heart of twenty-first century politics: no matter how hard national governments may try, it will simply prove impossible to stop the immense flows of human beings who are bound to make their way across in the years and decades ahead. No amount of border fences or Frontex patrols will be able to stop them. For an aging and privileged continent like Europe, this is actually a good thing: migration offers an opportunity to organically rejuvenate and enrich its greying societies. Merkel, for one, is well aware that with the lowest birth rate in the world, Germany is doomed without a large influx of labor power. For German capitalists, the Syrian exodus is nothing short of a godsend. Combined with a historical sense of guilt, naked opportunism explains at least part of Merkel’s relatively open-armed approach. But regardless of the question whether migration is “profitable” or “desirable”, there is a much more elementary reality Europeans are going to have to confront somehow: like it or not, a decade and a half into the twenty-first century, mass migration is here to stay. The so-called refugee crisis of the summer of 2015 was really only just the beginning. This year some 850,000 people fled to Europe. Similar numbers, if not more, are expected next year, and millions more will join them in the years to come. Tens, if not hundreds of millions are likely to follow as a result of climate change in future decades. How is Europe to adapt to such dramatic patterns of human relocation and the resultant demographic changes? To begin with, anxious Europeans will have to place the actual numbers and the reality of mass migration in perspective: the 850,000 people applying for asylum in Europe this year really do not amount to very much on a total population of half a billion Europeans. The numbers also pale in comparison to the 4 million registered Syrian refugees in the region (Turkey, Lebanon, Jordan, Egypt), or the 7.5 million internally displaced. Syria’s tiny neighbor Lebanon alone has taken in 1.3 million refugees – on a local population of 4 million. Seen in this light, it is difficult to understand what European leaders are complaining about. Secondly, if Europeans are serious about halting the flows of desperate people pouring into the continent, they will have to stop endlessly reproducing the underlying causes of the refugee crisis and of mass migration more generally. Europe’s responsibilities in this respect are not just historical; they are equally contemporary. War, poverty and persecution remain the principal drivers of migration – and the West has had a hand in furthering all of those through foreign interventions, predatory financial and commercial practices, and support for authoritarian regimes across Africa, Central Asia and the Middle East. We will soon be able to add anthropogenic climate change to this list. Third, if Europe really wants refugees and migrants to stop coming in “illegally” on inflatable dinghies and overloaded fishing boats, it will simply have to secure safe passage to those fleeing war, poverty and persecution. Nobody would pay in excess of 1.000 euros per head for a life-endangering boat journey across the Mediterranean if they could apply for their papers and permits abroad and pay 200 euros for a commercial flight to their destination of choice. Transport has to be “regularized” before migration can be regulated. Lastly, to accommodate the people who have already arrived and those who will continue to arrive in the future, Europe itself will have to change from within. Instead of jealously guarding their borders and privileges, Europeans will have to embrace the international responsibilities that come with their great wealth and power. If the continent is to avoid falling into another episode of world-historical darkness, it will have to rekindle the ideal of “solidarity beyond borders” that was always supposed to lie at the heart of the postwar European project to begin with. Luckily, the erosion of national borders is going hand in hand with the active mobilization of European society and of refugees and migrants themselves. As these developments continue to converge, it will become clearer and clearer that Europe is inexorably bound to become a continent of great diversity. Rather than resist this, Europeans should simply embrace the realities of the twenty-first century and welcome their new neighbors as their own. Our histories may differ but our future is common. Jerome Roos is a PhD researcher in International Political Economy at the European University Institute, and founding editor of ROAR Magazine. Follow him on Twitter at @JeromeRoos. This entry was posted in Civil Rights, Climate Change & Environmental Issues, Economics, Government, Homeless, Human Rights, Human Spirit, Immigration, International Agreements, Military, National Security vs Police State, Refugee Issues, Social Justice, Solidarity, Terrorism and tagged Capitalism, Civil Rights, Climate Change, Economics, Europe, European Union, Germany, Human rights, Human spirit, immigration, International Agreements, refugees, Security, social justice, Solidarity, Syria, terrorism on October 14, 2015 by ew.